AGRIPPINUS, an early seventh century Bishop of Como. St.Agrippinus reposed 615. ANTIDIUS (ANTIDE ANTEL, ANTIBLE, TUDE), a Bishop of Besançon, who was murdered by Vandals at the village of Ruffey-le-Château in present-day Bourgogne-Franche-Comté, France. There is some question to when St. Antidius flourished, and dates from the third to fifth century have been given. Most sources say he was a disciple of St. Ferreolus of Besançon (16th June), whom he succeeded as Bishop of Besançon, which would place him in the mid-third century However, if the fifth century date is correct, he could not have been St. Ferreolus’ disciple and successor. AVITUS (AVY), a monk at an abbey in Menat in Auvergne, who succeeded St. Maximin (15th December) as Abbot of the Abbey of Saint-Mesmin de Micy. In the last years of his life, St. Avitus left Micy to live as a hermit in a forest in the province of Perche, just south of Normandy. As is often the case disciples began to gather round the saint’s hermitage, eventually the number of disciples grew to the point that St. Avitus was forced to build a monastery for them and serve as their abbot. St. Avitus reposed circa 530. BOTULF and ADULF (BOTOLPH and ADOLPH), SS. Botulf and Adulf were brothers from England who entered a monastery in Belgium. St. Adulf went on to be consecrated Bishop of Utrecht and nothing further is known of him. St. Botulf returned to England, where, according to the Anglo-Saxon Chronicle , he founded and was first Abbot of a monastery at Iken in Suffolk, which was destroyed by the Danes in the ninth century. St. Botulf reposed circa 700. There are over seventy churches (including four at the gates of the City of London) dedicated to him. BRIAVEL, (Sixth Century), there is no record of her life extant, however it is generally believed St. Briavel was a hermit in the Forest of Dean in Gloucestershire England where the village and civil parish of St. Briavels commemorate her. GUNDULPHUS, a sixth century bishop in France who is believed to have reposed in Bourges. No further information, including the diocese of which he was bishop, is extant. HERVEUS (HERVÉ), a native of Wales who was taken when very young to Brittany. St. Herveus was blind from birth, and in his teenage years lived as a hermit and bard for a while. He entered, and served as abbot at one point, of a monastery in Plouvien. Though later St. Herveus and some of his monks moved to the Abbey of Saint-Guénolé de Landévennec. The year of St. Herveus’s repose has been given as somewhere between circa 556 and 575. He was buried at Landévennec Abbey. HIMERIUS, (Date Uncertain), a hermit, then monk, renowned for his acsetism who was chosen by the people of Ameila in Umbria to be their bishop. The years St. Himerius flourished are unknown, though there has been speculation it was in the sixth century It is said after his repose there were many miracles reported at his tomb. The relics of St. Himerius were translated to Cremona in Lombardy (circa 995), and interred in a church that was later destroyed. 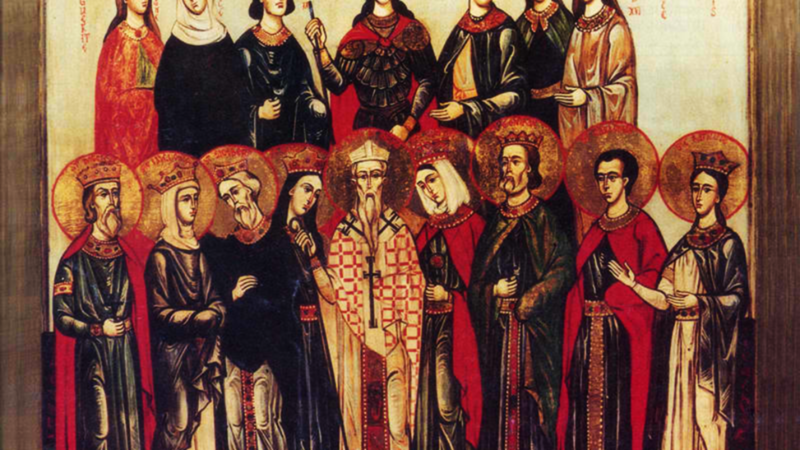 MARTYRS of ROME, (Date Uncertain), a group of two hundred and sixty-two Christians martyred at Rome. The Bollandists place their martyrdom during the Diocletianic Persecution (303 – 313), though many authorities place it later. MOLLING (MOLING, MYLLIN, MOLIGNUS, DAIRCHILLA), St. Molling received monastic tonsure at Glendalough, and went on to succeed St. Áedan (31st January) in the Bishopric of Ferns. He later resigned that See and founded an abbey at Achad Cainigh, which became Teghmollin, or Tech Molin, St. Mullins, Co. Carlow where he reposed 697 and was buried. MONTANUS, a Christian soldier originally believed to have been martyred during the reign of Hadrian (117 - 138). However, now the prevailing opinion is that he suffered during the Diocletianic Persecution (303 - 313). After an unspecified length of imprisonment, St. Montanus was taken to the Island of Ponza off the coast of Lazio. There he had a heavy stone tied around his neck and then was thrown into the Tyrrhenian Sea. His body was later recovered and enshrined at Gaeta. NECTAN, (Sixth Century), St. Nectan was the eldest of St. Brychan of Brycheiniog’s (6th April) twenty-four children. Whilst still a young man he was inspired to imitate the example of St. Anthony the Great and the other great ascetics. To that end he and several companions left Wales by boat landing on the northern coast of Devonshire at Hartland. One day St. Nectan found a stray pig, and returned it to its owner. In gratitude, the owner gave St. Nectan two cows, which were soon stolen from him. He found the robbers and attempted to teach them about Christ, however this enraged the robbers and one of them beheaded St. Nectan. The saint then picked up his head and carried it about one kilometre back to his cell and laid it down near a spring. Seeing this caused the robber who cut St. Nectan’s head off to go mad, but the other robber buried the saint. Since then the site of his tomb has been a place of many miracles. St. Nectan is the patron of Hartland, Devonshire, and there is an Orthodox house chapel (Moscow Patriarchate) dedicated to St. Simeon and St. Anna at Combe Martin, North Devon where St. Nectan is venerated. and left your father and mother for His sake to embrace the hermit's life. pray that He may save our souls. RAMBOLD (RAMNOLD), a monk at the Abbey of St. Maximin in Trier, and later Abbot of St. Emmeram’s Abbey in Regensburg. St. Rambold reposed 1001 at the age of one hundred.